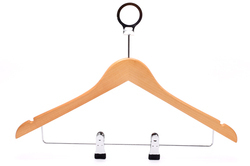 - dry more clothes like in less space with this cloth hanger with 8 removable clips. - 8 clips fastened with the arms of the hanger never get misplaced or lost. THE HANDY DANDY CLOTHES HANGER.